In this session it was about getting down to the grit and pushing forward, the was some suspicions of certain people lacking in work so we decided to address that and ask for all work so far to be handed in, and any research such as images to be printed off to stick on the wall. This was all done and it was evident some had done more than others but at this stage it wasnt so crucial but the issue of raising the bar needed to be pointed out now before the problem later down the line. With that beign said Myself, James and Viktor had produced several concept art pieces in collaboration with the block out, this was to develop ideas for the streets blocking volumes. The blocking volumes are essentially invisible walls that prevent the player from further advancing to a part of the level that they should not be able to enter, we have these purely because out project is a certain area and we do not want the player to be able to go beyong this area otherwise we have to model more and more or they see blank nothingless space which kills the realism. So instead of having an invisible wall we thought it was better design to have some form of realistic blocking in relation to the area. Ideas that myself and James discussed was things like furniture vans delivering and carrying stuff across the road, a broken down bus holding up traffic or a parade of celbrations of the world cup and so on. To make these concepts we used reference images that were photographs we had taken of the area then by putting it into photoshop we created a basic greyscale concept of our ideas. This is my first concept piece, this is down trinity house lane. I have place the blocking just after the indoor market so that the indoor market will be accessible, the blocking contains a market delivery van that is dropping off goods for the market such as a stall to go inside with like fruit and vegetables. The idea i had was that one of the boxes had been spilt and apples or vegetables could be spilled across the road with collisions on so you can kick them about. This gives the concept idea a place in the environment its not like ive just randomly slammed a piece of scaffolding there or something, the blocking has meaning. I go by the idea that in a game every object should have a bio to it or a story behind it, for example: who put it there, was it put there for a reason or convienience, when was it put there, why was it put there and where might it come from. If you follow that and can answer that in every asset you place and create your onto a winner. 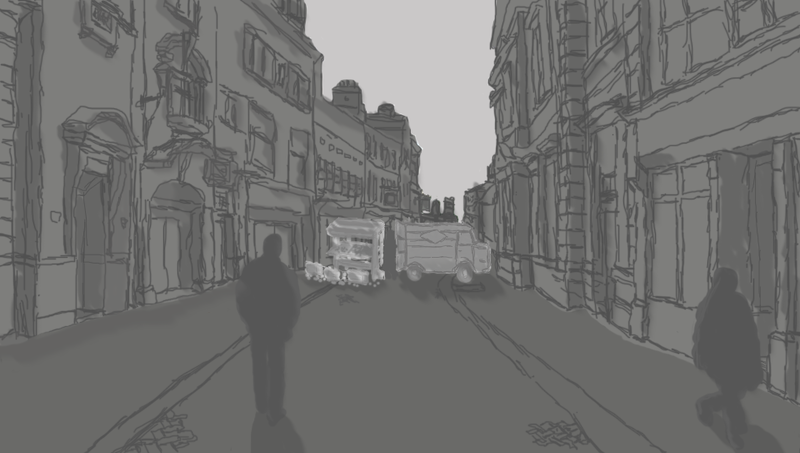 Back to the concept i have placed some silouhuettes of people to represent scale and how it will look with life in the street too. 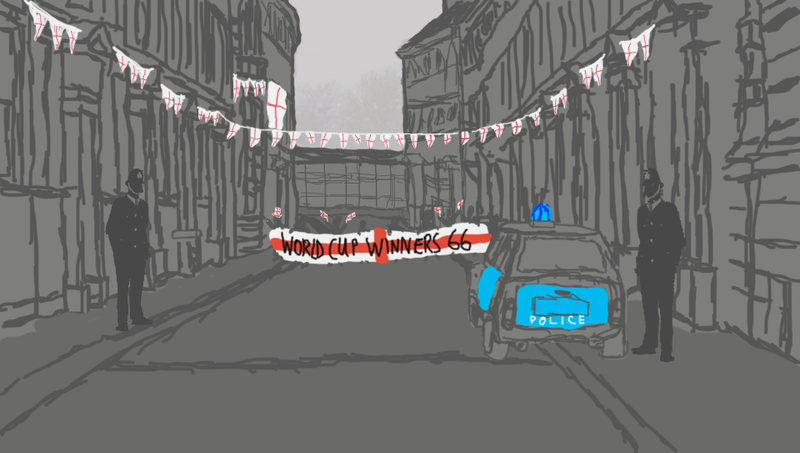 My second concept is on parliament street i was much more pleased with this concept idea as it could be used as a general overall concept theme for blocking in the area due to an event theme with the world cup celebrations in 1966. I placed a few banners here and there to give the concept height and decoration, the idea of policemen patrolling and overlooking the area to make sure that everything is under control fills out the area better. Research was put into this concept with the police car using reference of what cars were used for police cars, in this case the classic mini also the policemans outfit style is in relevance to the time period. I also added a tad of colour to this one just to make it pop a bit more than a basic different grey tone. The purpose behind these concepts were not only to get ideas for the blocking volumes for the grey block, it was to up my skills in photoshop. Personally i know that my photoshop skills were not up to scratch purely because it was an alien program to me that i only briefly went into with the adaptation year 1 project, so with being on the blocking out team i didnt really have any involvement in the concepts side of stuff originally but personal drive wanted me to move into the concept side of thinks due to my creative thinking behind the ideas. So i did both not neglecting the block out though, phillip decided to take full focus on it with the measurements we had gathered over the weekend whilst i worked with the concept guys and also went into the research team reading “memories of hull” book which had been ignored when taken out from the library 2 weeks ago by the research team. Then when we returned to uni on monday i continues to finish the block out with phil gathering further measurements of the alleyways we had missed, then moving onto adding basic colour schemed bsp (basic standard primitives) to fill out the level with the blocking concepts in basic form. We apologise for the poor videoing method through my phone but we didnt have screen video capture software at this time so this was the first method we had to hand at the time. We outline issues we came up with along the process of the blocking out such as the FOV (field of view) not feeling right with the street size and the scale having to measure out all week with a meter wheel due to the map we had not being accurate enough to made a block out from. Our ideas going forward was a day cycle so having 2 alternate settings day/night so have triggered lighting of streetlamps to show nightlife as well as daytime. The rest is in the video i dont need to elaborate as we covered it fairly well. I clocked around 50hours over the last week on client work with working on the block out and all the other areas aswell. 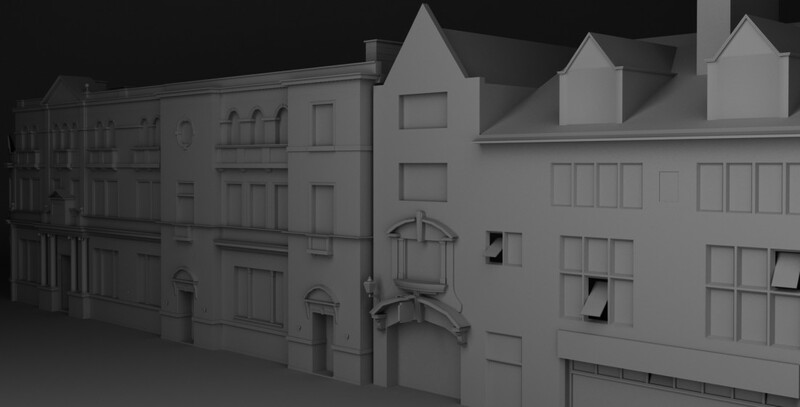 Everyone has now been allocated buildings my buildings are Marks and Spencers and what currently is Crawshaws, over reading week we have set a target of a basic model to scale and snapped to grid of your buildings with possible texture considerations, so nothing overnight and too much as of yet but a test to see if work is done. so give us a like, a tweet or an email if you have any email in related to hull in the 1960s or the 1960s in general like fashion or transport etc. Keep an eye out for us on Thursday 30th october as we are on the radio promoting our project! Categories: Client Project, Year 2 | Tags: 1960s, Adobe Photoshop, art, Block out, Brief, Client, Concept, Design, Design Process, Drawing, History, ideas., online presence, PHASEgaming, Project, research, unreal engine | Permalink.